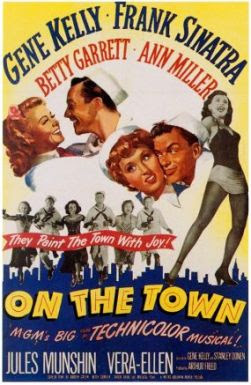 Today, I'm celebrating Frank Sinatra's 100th birthday with a look at one of his best MGM musicals, On the Town (1949). 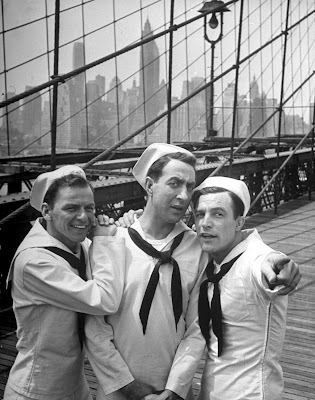 Here's Ol' Blue Eyes on the Brooklyn Bridge with costars Jules Munshin (center), and Gene Kelly (right). 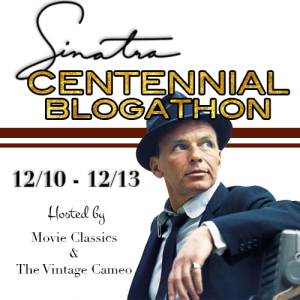 This article is part of the Sinatra Centennial Blogathon hosted by Movie Classics and The Vintage Cameo. On the Town (1949) is an old-fashioned movie with many old-fashioned charms including big musical numbers performed by big stars, MGM's luxe production values, and New York City in glorious Technicolor. On the Town tells the story of three sailors (Gene Kelly, Frank Sinatra, and Jules Munshin) who have 24 hours of shore leave in the Big Apple. The trio plan to squeeze every last minute of excitement out of their day off by touring NYC landmarks and finding some female companionship. The trio, who are portrayed as Midwestern rubes despite Sinatra and Munshin's noticeable New Yawk accents, are surprisingly successful at finding girlfriends in a short period of time. A brassy cabbie (Betty Garrett) takes a fancy to Sinatra, an amorous anthropologist (Ann Miller) can't keep her hands off Munshin, and Kelly becomes enamored of a struggling dancer (Vera-Ellen), whom he mistakenly believes is a big-time celebrity. On the Town is based on the groundbreaking 1944 Broadway show, which featured a symphonic score from Leonard Bernstein, a witty book and lyrics from Adolph Green and Betty Comden, and modern choreography from Jerome Robbins. The 1940's were a time of great creativity on Broadway with the birth of the fully integrated musical in Oklahoma!, and the introduction of a new kind of drama in The Death of a Salesman. Even by those high standards, On the Town stood out because it was one of the first musicals that treated modern American life and ordinary people as a serious subjects for art and dance. Meanwhile, MGM, which had a highly successful musical production unit helmed by producer Arthur Freed, was on the lookout for new material. Anchors Aweigh (1945), which paired Kelly and Sinatra as two sailors who are in love with the same girl, was a big hit, so Freed was looking around for a sequel of sorts for his two co-stars. A story about three sailors on the loose in the Big Apple seemed just the ticket, so MGM paid $250,000 for the rights to On the Town before anyone at the studio had even seen the Broadway show. Frank Sinatra and Betty Garrett in On the Town (1949). MGM chief Louis B. Mayer, who didn't have an avant-garde bone in his body, was seriously displeased when he finally saw On the Town. 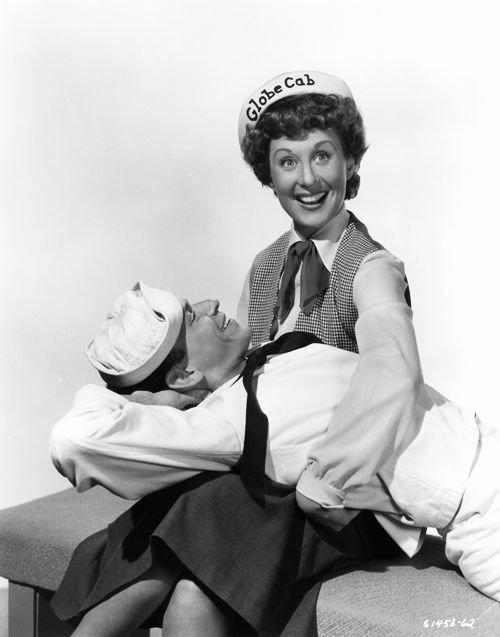 Mayer preferred wholesome fare like Meet Me in St. Louis (1944), and he didn't like Bernstein's arty score or the frank treatment of romantic relationships depicted in the show. However, he wasn't the type of man to waste $250,000, so he simply ousted theater director George Abbott, who was then slated to come to Hollywood to direct the film version, and he ordered Freed to make substantial changes to the script. Most of Bernstein's score was scuttled in favor of new songs written by Roger Edens and Lennie Hayton (the Bernstein songs that made it through are "New York, New York" and "Come Up to My Place") and Comden and Green were brought to Hollywood to bang out a rewritten script that would pass the censor's approval. Ironically, Comden and Green were required to change the "New York, New York" lyrics from "it's a helluva town" to "it's a wonderful town," although the censors left the innuendo-laden "Come Up to My Place" intact. 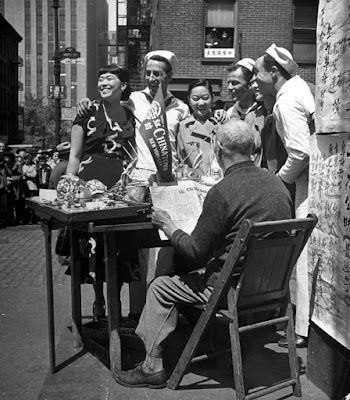 Jules Munshin, Frank Sinatra, and Gene Kelly on location in Chinatown in On the Town (1949). Despite these changes, On the Town works really well onscreen. Co-directors Kelly and Stanley Donen used two innovative techniques that make this movie one of the best Freed-produced musicals. The first innovation was the two dream ballet sequences, "Miss Turnstiles" and "A Day in New York" (both of these compositions are by Bernstein). Kelly and Donen certainly weren't the first to use this idea -- there is an elaborate dream ballet in the Shirley Temple chestnut The Little Princess (1939) -- but dance had never really been used to advance the plot in American musicals before On the Town. The success of this movie led to a plethora of dream ballet sequences in American musicals like The Band Wagon (1953), An American in Paris (1951), and Singin' in the Rain (1952). Kelly and Donen's second innovation was location shooting. At the time, most movies were shot on the studio backlot, but the nine days of filming in New York City gives On the Town an immediacy and energy that is lacking many other musicals. The "New York, New York" scene is one of old Hollywood's most memorable moments, although the cast and crew did encounter some problems. Sinatra and Kelly were major celebrities and fans followed the men throughout their tour of the city (viewers can still clearly see the crowds in the Rockefeller Center shot). Also, Munshin was terrified of heights and had to be coaxed onto the observation deck of the RCA Building where he was tethered between his two co-stars for his peace of mind. 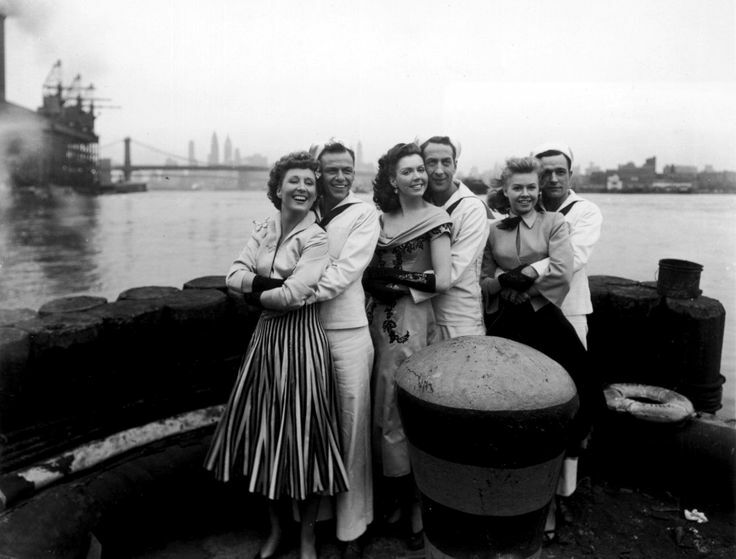 The cast of On the Town (1949): Betty Garrett; Frank Sinatra; Ann Miller; Jules Munshin; Vera-Ellen, and Gene Kelly. 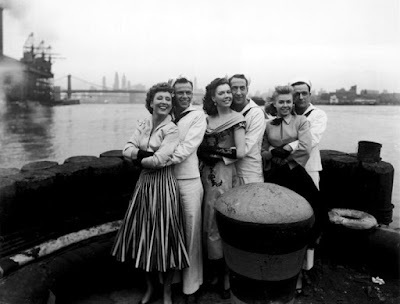 For Sinatra, On the Town came during a time of transition. His popularity as a singing star had somewhat faded, but he was still a major film star (MGM coughed up $250,000 for his services while Kelly got $42,000, and Munshin a paltry $1,500 per week). Sinatra didn't relish taking the role -- the always sharply dressed star didn't like wearing the sailor suits, and his role is basically a supporting part -- but he is great in On the Town. Sinatra successfully plays against type as a nerdy Midwestern guy who is more interested in finding the long-gone landmarks in his grandfather's 1905 guidebook than in girls. Also, I think he and Garrett have the most chemistry out of the three couples in the movie. On the Town was Sinatra's last big hit for MGM. He wouldn't have another screen success until his Academy-Award winning comeback in From Here to Eternity (1953). I'll leave you with Sinatra, Kelly, and Munshin hitting the Big Apple in one of the most famous scenes in American films. Happy 100th, Frank! On the Town will air at 9 p.m. Dec. 16, 2015, and at 11 a.m. Feb. 18, 2016, on TCM. It is also available for streaming on Netflix Instant and it is available on DVD and Blu-Ray. I just re-watched this one the other day, so I love reading all this background. I always love that shot of Rockefeller Center crowds—how cool to have seen that movie magic happening! And now that you point it out, there are definitely a few songs that felt like they had a more Meet Me in St. Louis-vibe... but I feel like the overall sauciness of the musical still comes through :) Thanks so much for participating! P.S. I always feel bad because I can NEVER remember Jules Munshin's name! I always think of him as "the third guy". On the Town is my favorite musical of all time! Indeed, Sinatra is great in his role and has a helluva chemistry with Betty Garrett! This film never fails to make my mood better. On the Town just makes you smile. I had no idea about the original lyric being 'a helluva town'! Must admit, the fact that so many Bernstein songs were junked sets my hackles rising, especially the fantastic I Can Cook Too! but it was very interesting to learn more about why, and about the link with Meet Me in St Louis, which I also love. Great posting, Amanda - thanks so much for taking part in the blogathon. I would watch Gene Kelly do anything. Me too! A handsome gent!